Lately I’ve been more and more impressed with J.Crew – I used to think some of their pieces were a little overpriced for what they were (and sometimes still do), but I truly believe the quality and styling of J.Crew’s pieces within the last year has improved immensely. The sweaters are soft (no longer scratchy), the fit of the clothes is more accurate and the prints & cuts are much more flattering. The whole look is less preppy and more classic, while incorporating more daring prints and fun color. Some of my favorite pieces from J.Crew right now include this skirt (hoping more stock will come in! ), these pumps and this sweater/shirt combo. Classics that will stand the test of time, don’t you think? A few budget buys from their current collection include this drop-waist dress, this textured slouchy sweater and these colorful New Balance for J.Crew sneakers. Click here to shop all new arrivals! I’ll have on of each please :) love the latest new arrivals. Loving so many things here especially that red clutch and that elegant floral pencil skirt! You can never go wrong with J.Crew. OMG… was tempted to share some of the same goodies. No one does fall clothes like J.Crew…! I’m obsessed with J.Crew, especially the fall collection” I’m hoping the skirt will restock too. 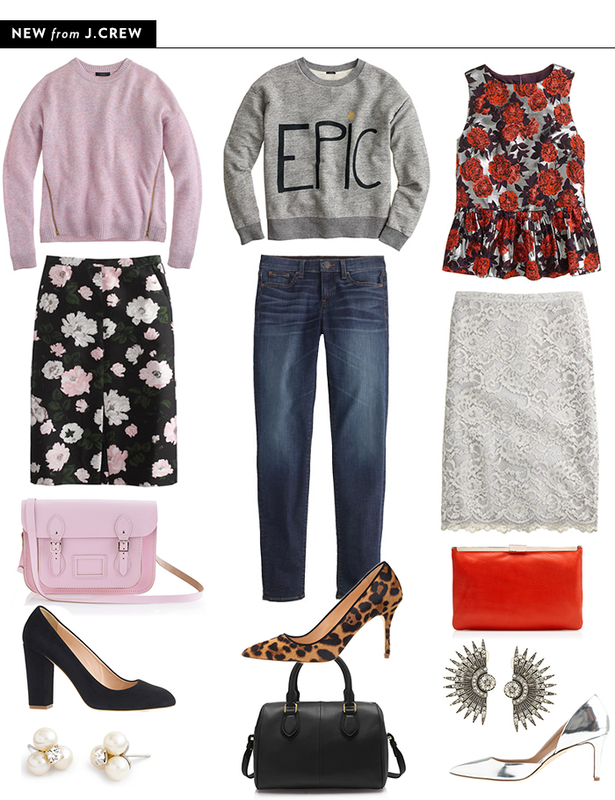 Love that Epic sweatshirt and the floral skirt…both of those pieces caught my eye as I browsed the new arrivals. That lace skirt is absolutely perfect! Love it! Definitely loving more of J.Crew’s stuff lately! Love the lace and the peplum, so pretty! LOVE the pink sweater and EPIC sweatshirt! I have had similar reactions to J.Crew…..sometimes over priced, but they do carry good solid pieces. Absolutely love the first sweater! That Epic sweatshirt is a must have!